Disabled access: The lodges we stay at have wheelchair facilities and our vehicles are adapted for wheelchair use with ramps etc..
Amboseli National Park is located about 240 km from Nairobi in loitoktok district, Rift Valley province. The main ecosystem in the park is the savannah grassland. This park is famous for the huge herds of elephants which are to be found here. Other game include lions, burchells zebra, black faced sandgrouse and wildebeest family. Mount Kilimanjaro, Africa�s largest mountain lies just over the border in Tanzania, but the most impressive views of its snow-capped peak are to be found in Amboseli. Lake Nakuru is home to thousands of flamingos which join into a massive flock to fringe the shores of this soda lake. The national park is also a very important sanctuary for both black and white rhino which are quite difficult to spot in other areas. The park abounds with game, many huge herds of waterbuck, zebra, buffalo, the endangered Rothschild Giraffe and more� Very good chance to see a leopard and lion too. Take some time to explore beyond the lake and visit the forest, cliffs and waterfalls. Each year the Mara plays host to the world�s greatest natural spectacle, the Great Wildebeest Migration from the Serengeti. From July to October, the promise of rain and fresh life giving grass in the north brings more than 1.3 million Wildebeest together into a single massive herd. They pour across the border into the Mara, making a spectacular entrance in a surging column of life that stretches from horizon to horizon. At the Mara River they mass together on the banks before finally plunging forward through the raging waters, creating a frenzy as they fight against swift currents and waiting crocodiles. The wildebeest bring new life to the Mara, not just through their cycle of regeneration of the grasslands, but for the predators that follow the herds. The Mara has been called the Kingdom of Lions and these regal and powerful hunters dominate these grasslands. Cheetahs are also a common sight in the Mara, as are Hyena and smaller predators such as Jackals. Maasai warriors share the plains with hunting lions, a place of mighty herds and timeless cycles of life, death and regeneration. Tarangire National Park is a diverse and picturesque African wildlife sanctuary, located on the Tarangire River, from which is derived its name. During the annual dry season which starts in August till October, the park attracts one of the biggest concentrations of wildlife in Tanzania. During this time the river provides the only permanent water in the area. The park is not overcrowded with tourists which makes it very attractive. Enjoy the beautiful views of riverine forests and acacia woodlands and endless rolling hills. The park has one of the largest elephant herds in Africa, amongst many other wildlife. Lake Manyara National Park, the park derives its name from the Maasai word �Manyara� which is the name of the plant Euphorbia tirucalli. The approach to the park is absolutely spectacular, the outstanding landmark is the magnificent rift wall with the National Park nestled at the base of the escarpment. Despite the fact that the park is only 330square km in area- it contains a large variety of habitats; the rift wall, the ground water forest, acacia woodland, areas of open grassland, the lake shore, swam and the actual lake. Due to this variety the park has a variety of wildlife, over 380 species of birds, some of the migratory can be found in the park. Enjoy a day in the park with a packed lunch at one of the picnic sites. Look out for lions sleeping in a tree! Serengeti National Park, the word � Siringet� is the Masai word for �endless plains�, it is for these endless plains the park derives its name Serengeti from. The park is one of the world�s best known wildlife sanctuaries and symbolises the classic Africa safari. With more than 2million wildebeest and a large number of Thomson gazelle and zebra, it has the greatest concentration of plains game in Africa. The space is endless even at the height of the wildebeest migration when over one millions animals are moving, the Serengeti never seems crowded. The park covers an area of 12,950 sq km and lies between the shores of Lake Victoria in the west, Lake Eyasi in the south and the Great Rift Valley to the east. The Ngorongoro Crater, the main feature in the Ngorongoro Conservation area is the Ngorongoro Crater, the world�s largest unbroken volcanic caldera. The crater is 600 mtr deep, about 20km across and 300 sq kms in the area. The steep sides of the crater provide a natural enclosure for a very wide variety of wildlife and therefore great for game-viewing. The accommodations are built high on the crater rim with amazing views over and into the crater. The Ngorongoro Crater is a breathtaking natural wonder. �It is a big market out there. What�s the travel industry doing about it? In a word, nothing,� commented Ataxia South Wales Chairman Alan Jones when discussing a report that shows the UK�s estimated 10.6 million disabled people have a combined annual spend on goods and services of up to �80 billion. Travel businesses failing to take into account the disabled market are missing out on up to �80 billion of potential spend. The headline figure was discussed at the fourth and final round table conversation which was organized by The Travel Tech Show at WTM and Amadeus and focused on disabled and responsible travel. The event featured an in-depth and informed discussion as eight experts from both business arenas gathered to discuss the markets. But it was the figure from the UK Government�s 2012 Legacy for Disabled People, Inclusive and Accessible Business which provoked much discussion. Jones said the problems start as soon as he tries to book a holiday as many people in the industry see his wheelchair rather than the human being using it, leaving agents too embarrassed to deal with. Lundy said the information needs to be accurate to allow disabled people to make informed decisions. She added it must also take in to account that some disabled people are blind or have learning difficulties and will need the information presented in a different way. Meanwhile the group discussed how responsible travel is facing its own problems, largely thanks to the market being so fractured. EcoGo.org Founder Pamela Lanier said in an ideal world responsible travel will penetrate people�s general consciousness so all holidays ultimately are responsible. Meanwhile, Kirby said small genuine responsible travel companies are facing problems marketing themselves as larger companies use the phrase to market themselves, whether or not they meet the criteria. 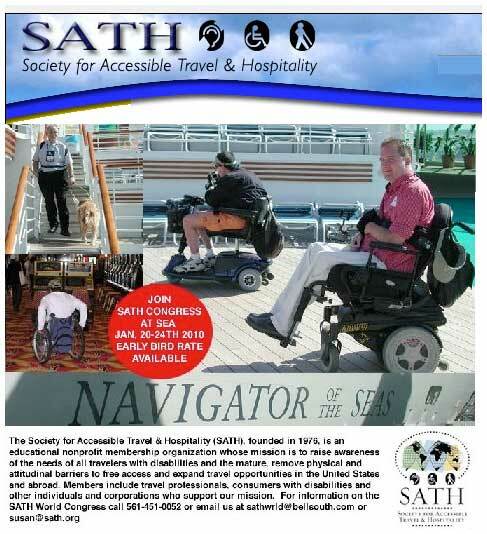 The Society for Accessible Travel & Hospitality (SATH), founded in 1976, is an educational nonprofit membership organization whose mission is to raise awareness of the needs of all travelers with disabilities, remove physical and attitudinal barriers to free access and expand travel opportunities in the United States and abroad. BOCA RATO: SATH, Society for Accessible Travel & Hospitality has launched a new version of its popular website, www.sath.org. The new website is for both consumers and the travel, tourism and hospitality trade, and is loaded with information for travelers with disabilities and those who serve them. Keeping in mind accessibility for all, the new SATH website will be rolling out additional features in compliance with industry and government web standards over the course of 2003. "For the past several years, we have had a good website as far as content was concerned, and now we're ready to move further into the 21st century with our dynamic new site," stated Stuart Vidockler, SATH Chairman. "We have made great strides in our 27 year history and will continue to do so with the help of all our partners." The website features an easily searchable listing of resources for information on traveling with all types of disabilities, as well as companies that offer services and further information. There are links to many companies that SATH works with, so visitors can quickly find more details as they need it. 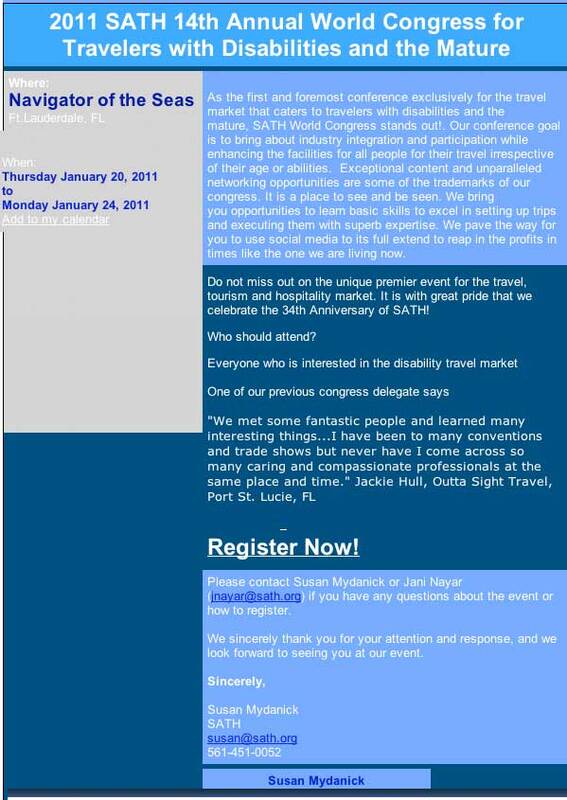 Sample articles from SATH's publication OPEN WORLD are also featured, as well as highlights of the recently completed 7th World Congress in Miami, and the next Congress in January 2004. A Calendar of Events lists upcoming conferences, trade shows and workshops where SATH will be participating. The new website was designed and developed by www.123yourweb.com. For further information contact SATH at 212-447-7284 or info@sath.org.